2.) 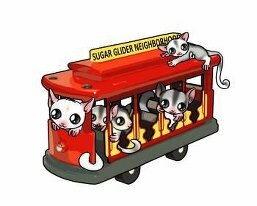 What Company did you purchase your Sugar Glider from? 4.) What was the overall health condition of your Sugar Glider? 6.) Did you seek medical treatment within the first two weeks after purchase? If so, please provide us with the name, address, and phone number of the Veterinarian who treated/examined your Sugar Glider. 9.) Do you feel that you were given support and help when encountering a problem with your sugar glider from the seller? 10.) Do you feel that you were well informed about the care, time required, diet, and health of your Sugar Glider? Linda, I have only bought one glider from the above named places. Should I fill out one for that glider or all gliders. All the rest came from friends/private breeders that I know. Alicia I think she means fill it out IF you've purchased through them? Alicia, You only need to fill out the form for the one glider that came from one of the above named places.